Coblentz (pictured) is a USDA-ARS research dairy scientist/agronomist at the U.S. Dairy Forage Research Center, Marshfield, Wis. Akins is an extension dairy management specialist, UW-Madison. 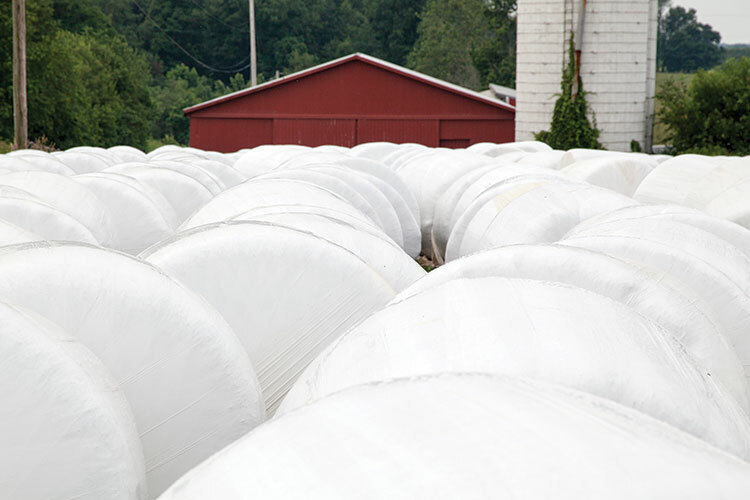 Wrapping moist, large round or square bales in plastic to create an anaerobic environment for silage fermentation has gained steadily in popularity, particularly for small and midsized dairy or beef producers. Most harvest principles for baleage are similar to those of traditional chopped silages; among these, the exclusion of oxygen is paramount. For baled silages, oxygen elimination is critical because silage fermentation is inherently restricted by three key factors: 1) moisture concentrations (45 to 55 percent) are typically drier than most chopped silages; 2) most baled silages are packaged in long-stem form, which restricts access of fermentation substrates (sugars) to lactic acid-producing bacteria; and 3) baled silages are often less dense than well-packed chopped silages. From a practical standpoint, the primary mode of preservation for baled silages is by excluding air, with less stability obtained from the formation of desirable fermentation products and a low (acidic) final pH. The effects of failing to exclude oxygen can be further subdivided on the basis of oxygen permeability before or after wrapping the bale in plastic, both of which will affect silage quality negatively. Sometimes there is a delay between the time a bale is made and when it is wrapped. This can occur because of inclement weather or when your custom bale wrapper is delayed and arrives late to the farm. Whenever there are delays associated with the application of plastic wraps to unfermented silage bales, the response is similar to that exhibited by wet hays. Plant sugars are respired as carbon dioxide, water, and heat; this causes internal bale temperatures to rise in a phenomenon referred to commonly as “spontaneous heating.” The consequences of spontaneous heating affect both silage fermentation and silage quality. Silage bales heat quickly after baling and can reach temperatures of approximately 150°F within three days; this was demonstrated in one of our recent experiments with alfalfa baled at about 60 percent moisture. We delayed the application of silage plastic by zero, one, two, or three days. In that study, the internal bale temperature at the time plastic was applied rose from 95°F to 147°F over the three-day wrapping delay. After being wrapped, bales heated an additional 6°F and then temperatures declined quickly once oxygen was eliminated from the bales. No internal bale temperature exceeded 86°F after 23 days. It is important to emphasize that each management situation is different, but other studies using grass species also suggest that internal bale temperatures of about 120°F may be fairly common if the application of plastic is delayed by about 24 hours. Two key changes occur within unwrapped bales during spontaneous heating that complicate subsequent fermentation. First, the respiration of plant sugars to carbon dioxide, water, and heat depletes the available pool of substrate required for silage fermentation. The hotter the bale gets, the more substrate loss occurs. Secondly, buffering capacity (the inherent or natural resistance to pH change) elevates in association with wrapping delays. Both of these factors create barriers to silage fermentation, ultimately limiting the production of fermentation acids and inhibiting a drop in final silage pH. When wrapping is delayed, the total production of fermentation acids declines sharply. In addition, the proportions of various fermentation acids also change. In our experiment, following a wrapping delay of one day, lactic acid comprised about 51 percent of all fermentation acids. The ratio of lactic to acetic acid was 2.1. After a wrapping delay of three days, lactic acid comprised only 32 percent of all fermentation acids, and the ratio of lactic to acetic acid fell to 0.74. Lactic acid is the most desirable fermentation acid, and is most capable of driving down the final silage pH. Research also suggests that forages compromised by delayed wrapping may be susceptible to clostridial activity that produces ammonia and butyric acid as end products, which are both undesirable. Wrapping delays that lead to spontaneous heating will create the same type of losses in nutritive value that are observed in hay that is baled too wet. Generally, the respiratory loss of sugar acts indirectly to boost the concentrations of more inert, less digestible forage components. Structural fiber (neutral detergent fiber, acid detergent fiber, hemicellulose, cellulose, and lignin) and ash levels both rise in response to heating. heating occurs; however, that can be deceiving because protein digestibility also may decline. Heat damage to protein is actually more likely to occur with baleage than with lower moisture hay bales. The overall effects of spontaneous heating on the energy density, or total digestible nutrients (TDN), of baled silages are decidedly negative beyond what is considered a normal loss with excellent harvest practices (1 to 2 percentage units of TDN). All hay-crop silages lose some energy during fermentation, but excessive heating amplifies those losses. Extension recommendations for an appropriate, but reasonable time interval between baling and wrapping can vary widely, ranging from two to 48 hours. Based on our research, the effects of a 24-hour wrapping delay on silage fermentation and forage quality of baled alfalfa silages were relatively minor.